When we think of dementia, we usually think of people experiencing memory loss — things like forgetting people’s names and failing to recognize family members. But there are other symptoms of dementia, ones that are only apparent to those experiencing its effects. They come up when doing everyday tasks like making a cup of tea — a process that can suddenly seem hopelessly complicated when your planning faculties are impaired. Even walking down the street can be terrifying: If your depth perception is gone, water puddles can look like gaping holes in the pavement. Alzheimer’s Research UK (ARUK) wanted to help people better understand these experiences and feelings. Their goal was to show the general public that dementia is far more complex than memory loss alone, and to challenge the misconception that it comes inevitably with age. The condition is actually caused by brain diseases that, with resources and research, can be understood and defeated. ARUK approached Google UK last year for help with this challenge. We’d recently started a free program for nonprofits focused on building creative skills for innovation, led by Googler volunteers. After conducting user research and brainstorming a range of ideas with ARUK, our Google team set out to help create a virtual reality (VR) experience that would show everyday activities as experienced by someone with dementia. Working with a focus group of people with dementia and carers, as well as scientists from the University College of London, we put together a list of symptoms. In partnership with digital services firm Visyon and production company Across the Pond, we then translated them into three distinct scenarios: making tea, walking home, and shopping at the supermarket. The introductory film features British journalist and television presenter Jon Snow. The result is A Walk through Dementia, three VR stories that show the subjective experience of a person with dementia by focusing on some of the lesser known symptoms, like visual disturbances and disorientation. 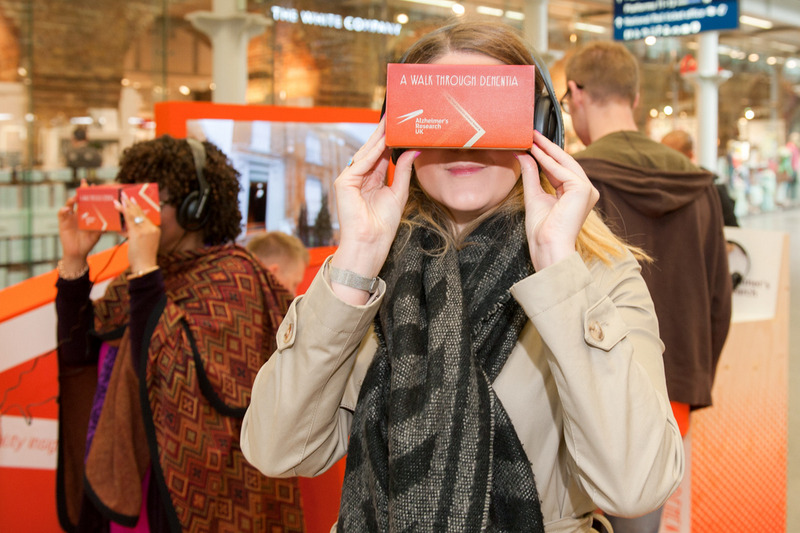 Anyone can access the stories for free via the custom-built app or YouTube, using either a desktop or mobile device, or a VR viewer like Cardboard for a more realistic, immersive experience.